What’s on Tap for April’s General Membership Meeting . . .
Join us at Catfish Lou’s on the first Wednesday of April for the Cascade Blues Association’s monthly general membership gathering. We will be offering two sets of top blues music this month featuring two long-time groups of friends who are always highly entertaining. Our monthly meetings are one of the best ways to catch up with great friends and see two musical acts drawn from our wealth of regional talent. Plus you’ll have the opportunity to win prizes just by being in attendance. F or our opening set, traveling from up from Medford will be the acoustic duo of David Pinsky & Phil Newton. 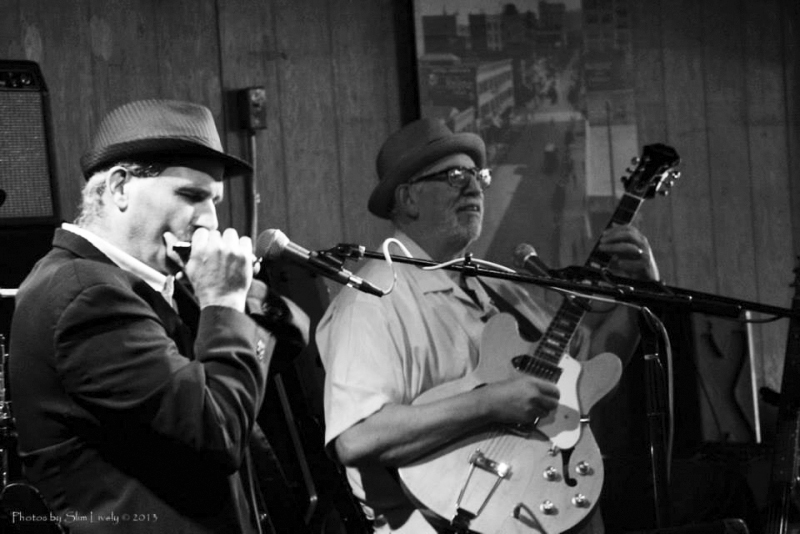 No strangers to the CBA, they have represented our society in Memphis at the International Blues Challenge in the past. They have been a major part of the Southern Oregon blues scene for over thirty years working as both an acoustic and electric duo. David’s propulsive guitar, welded to Phil’s harmonica chops, provide a steady groove reminiscent of the 60’s Chicago style duets. The two on occasion will also employ a twin harp attack. Both David and Phil bring decades of vocal experience, with David concentrating on his original compositions and Phil interpreting Blues and roots. After a short break to make announcements of what’s happening and coming up in our area, and to do our popular prize ticket drawing, the stage will be taken over by Drop Dead Red. This 7-piece band is exciting and features top-notch musicians who bring decades of musical experience to this quality, talented and well-orchestrated outfit. The band plays a mixed bag of music which is sure to bring a night of listening and dancing pleasure. 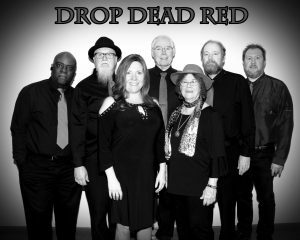 Drop Dead Red consists of a diverse collection of musicians who’ve worked with some of the most recognized artists of the area and nationally. Theresa Lowe fronts the band with her vocals which she shares the vocal duties with percussionist Wilton Merritt. Jon Tennis on guitar, Tim “The Deacon” Doyle on keys and bassist Joanne Mead all also provide vocals, while Bob Anderson plays sax and newest member Chandler Bowerman is on drums. Always a hit whenever they play the CBA meetings, Drop Dead Red is packed full of mighty fun!